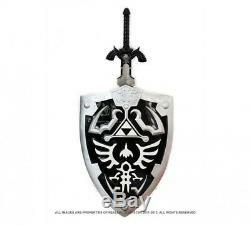 Full SIze Dark Link's Hylian Shield Master Sword from the Legend of Zelda Combo. DARK LINK'S HYLIAN SHIELD. Protect yourself with the power of the tri-force by carrying this beautiful Dark Hylian shield from the Legend of Zelda. This high quality poly resin shield looks great on your arm. Perfect for any Zelda fans or for Cosplay use. This awesome shield measures 19" by 25". Weight is about 6.8 lbs. DARK LINK'S MASTER SWORD. This is EXACT REPRODUCTION of the Zelda Dark Link's Master Sword From the video game. This sword is not the cheap knock off you have seen with the flat guard. Now you can own this LIMITED SUPPLY sword which comes with the Hard Wooden Plaque. The design on this sword will blow you away. So get yours today before its all gone. Overall Length: 37 " Blade: Unsharpened Blade Length: 25" Blade Material: 440 Stainless Steel Handle Length: 7 Handle Material: Stainless Steel Condition: Brand New Accessories: Wooden Plaque. All presumed defective or wrong items must obtain an authorization before returning. Item must be in their original packaging. No signs of being used, and or scratches. Some laws may require that you be at least 21 years of age to receive the item. All knives and swords must be handled with extreme care. It is your responsibility to check the item for any possible defects before using this item. We are not responsible for any injuries, death, or property damage caused directly or indirectly through the use or misuse of this item. Item must be in their original packaging and accessories. It is our commitment to provide you with the best value, at the best price. If you find the same product at a lower price, please contact customer service. Real Sword Master is an exciting new destination for name brands swords, knives and others armory dedicated to providing the best prices, selection, and overall experience you'll find online. How Real Sword Master Works Shop our wide selection of swords, knives and armory your way--we've made it easy to shop by category, color, size, brand, or price. New products and markdowns arriving weekly! Were always giving you opportunities to save even more on all your favorite handmade swords, samurai swords, Japanese katana, animation, video game, fantasy, ninja gear, medieval armory, accessories, and more! Who we are Real Sword Master was based in Los Angeles response to customers' desires to shop a destination dedicated to swords, knives, and others armory. Our site is built for these categories, and the swords, knives enthusiasts who shop them this is our focus. We are a unique store that offers our customers the ability to find what they want easily and we deliver it as quickly as possible reliably and securely. We take our shopping seriously our staff is dedicated to providing the best possible experience. We guarantee the 100% authenticity of every product we sell. Brand New We carry a full line of swords, knives, and the majority of our products are Brand New, unless otherwise noted. Listing and template services provided by inkFrog Open. The item "Full SIze Dark Link's Hylian Shield Master Sword from the Legend of Zelda Combo" is in sale since Sunday, April 24, 2016. This item is in the category "Collectibles\Knives, Swords & Blades\TV, Film & Game Replica Blades". The seller is "real-sword-master-com" and is located in Rancho Cucamonga, California. This item can be shipped worldwide.